The People’s Choice and Critics’ Choice Awards aired this past week but did anyone care? The first real kickoff for the awards season is Sunday night’s Golden Globes, airing from 8 p.m. to whenever on NBC. I’m excited about the return of the Globes in all its splendor after the sad press conference last year. Jennifer Lopez will open the show by presenting the first award, Best Supporting Actress in a Motion Picture. 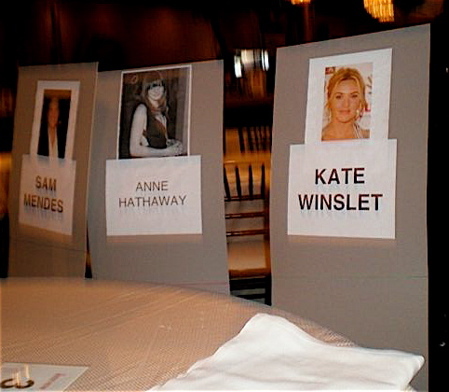 Lopez will be seated at the “Hot Latinas” table in a front corner with nominee Penelope Cruz (for Vicky Christina Barcelona) and presenter Salma Hayek. So many A-list movie stars are attending that TV nominees like Steve Carell are relegated to the back of the room. Even It-Girl Tina Fey doesn’t fare much better. Simon Baker and Eva Longoria Parker will be presenting Best Supporting Actor and Actress in a TV series, mini-series or TV movie. They themselves might qualify for Best Looking Presenting Duo. Johnny Depp will make his first appearance as a Globes winner (he finally won one last year for Sweeney Todd) to present Best Actress in a Motion Picture, Comedy. Sting will be presenting Best Song. Bruce Springsteen will most likely win for The Wrestler and seeing him on stage with Sting is going to make me hyperventilate. Enjoy the show and check back here afterwards for lots of coverage, including reports from the after-parties! yeah !! can’t wait ! I was going to take a pass on the show, but you mentioned Sting and Springsteen in same sentence and changed my mind. Very cool! I really like the letter from Hathaway. Love it! Can’t wait for the fashion!